There's good and bad news for anyone who wants to close a credit card with a balance. First, the good news. You can close a credit card even if it still has a balance. Your credit card issuer won't require you to pay off your balance before closing the card. In some instances, closing the credit card could be beneficial. For example, if your credit card issuer is raising your interest rate, you might close your credit card to opt-out of the higher interest rate. The 45-day notice will give you time to pay off the balance or transfer it to another credit card rather than close the card while it still has a balance. Now for the bad news. 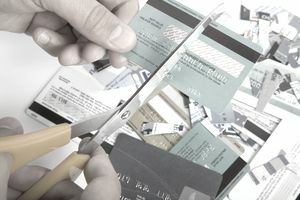 Closing a credit card rarely ever helps your credit, regardless of whether the account has a positive or negative history. After you close your credit card, it continues to be reported to the credit bureaus as normal. The only difference is that your card has a "Closed" status. Your monthly payment history is still updated each month as you make - or don't make - your payments. Closing a credit card with a balance could hurt your credit score. When your credit score is calculated, it considers the amount of your credit card balance relative to your credit limit. This ratio is known as your credit utilization, and it's one of the major factors that influence your credit score. A closed credit card doesn't have a credit limit, so the credit scoring calculation could penalize you for having a card with a balance and no credit limit. Once you've closed your credit card, you won't be able to make purchases on your credit card, and you'll probably lose any credit card rewards you've accumulated. Don't forget about your credit card payment after you've closed your credit card. You're still required to make your monthly minimum payment by the due date. If you're late on a payment, you face the same consequences: late fees, late notices on your credit report, and a penalty rate increase. Closing your credit card doesn't alleviate you from monthly interest. Your balance will still be charged interest each month until your credit card balance is completely paid off. If you make only the minimum payment on your credit card, it will take you longer to pay off the credit card, and you'll pay more interest than if you doubled up on payments and paid your balance faster. You shouldn't let the fear of a potential loss of credit score points make you keep a credit card open. Here's why. You may need to close the credit card, for example, if you can't curb your credit card spending and you're falling into debt. A temporary drop in your credit score is preferable to being knee deep in debt you can't afford. In addition, the loss of points that comes from closing a credit card with a balance can be recovered over time as you pay off your balance. Consider your overall long-term financial health as you decide to close a credit card that has a balance.